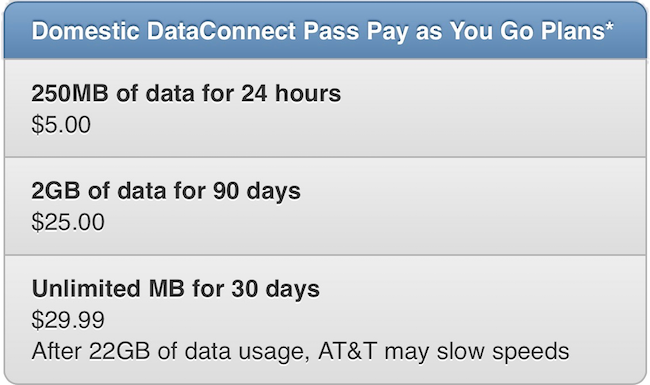 AT&T has a $30 plan with unlimited data and no max download speed? I found this hard to believe but its true. But, it’s not a phone plan, its a data only plan. It’s part of their DataConnect Pass Plan for Tablets or in there words, eligible devices. I’m wondering if a smartphone is a eligible device? There are three plans here. Five dollars ($5) for 250 MB and its active for 24 hours. $25 for 2 GB that is active for 90 days, and $29.99 with unlimited data active for 30 days. Now remember this is not a phone plan, you can’t transfer your number to it. If you wanted to use and need phone service, you’ll need to use a VoIP phone service and the appropriate app on your device. Also of note, you cannot sign up for this plan on an automatic renewal, you’ll need to buy a pass every 30 days, and there is no guarantee for how long this will last. If you not sure what I mean by VoIP plan, I talking about a services that provides you with a phone number you can use for talk, text, and picture messages but these services use your internet connection for those services. This could be Skype, Google Voice, or even something like FreedomPop or TextNow’s voice service. With any VoIP service, you need to check which of those three services are provided and whether or not they are included for free or our a premium service. While I always though it would be cool to try a data only SIM in a smartphone I’ve never got around it. Over time, my needs have changed and I currently need less data but unlimited talk and text services. While I’m tempted to try this out for fun, it wouldn’t be a long term solution and replace my phone service, although the $30 price is attractive and about the most I want to spend for service at this time.